TODAY: Mostly Sunny, Breezy. Hi 70. Winds: NW 10-15 mph. Gusts to 25 mph. TONIGHT: Partly Cloudy. Lo 47. THURSDAY: Scattered Light Showers. Hi 65. Behind last evening's front, today will be more pleasant. Expect mostly sunny skies with highs around 70 degrees this afternoon. It will be breezy at times, but that will help things dry out from last evening's rain. Tonight will bring partly cloudy conditions with cooler low temperatures, in the upper 40s. The end of the week will bring rain chances, especially Friday. Ahead of a front tomorrow, expect lots of clouds, and occasional light showers. Highs will be in the mid-60s. Friday looks wet, unfortunately. Expect periods of rain with some heavy rain possible Friday afternoon and evening. Highs will again be in the mid-60s. Rainfall amounts through Friday could be right around 1". 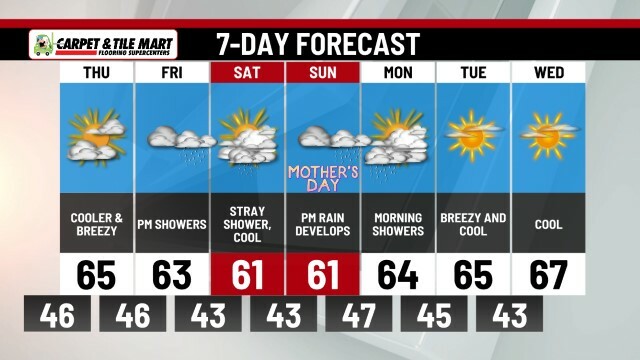 Friday's rain clears in time for the weekend, with a cooler and breezy Saturday on tap. Sunday will be milder with a few stray showers possible. Temperatures after today and through the weekend stay fairly seasonable with highs in the 60s through early next week.